Baahubali's record breaking 50 days with 600 Crores gross! 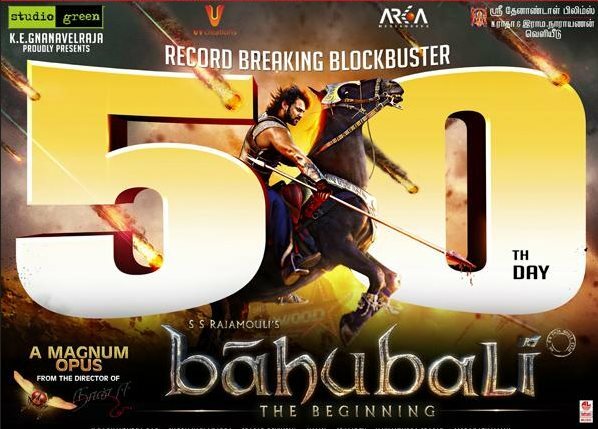 Home » Baahubali | Prabhas | Rajamouli | Sathyaraj » Baahubali's record breaking 50 days with 600 Crores gross! Vincent Tabaillon, editor of popular Hollywood films like Taken 2, Now You See Me and The Incredible Hulk will be editing the international version of Baahubali. The international version will be premiered at Busan International Film Festival (South Korea) and the duration of the film will be will fifteen minutes shorter than the original domestic version. The film has recently completed its 50 days run at the box office and has grossed more than 600 crores. Other than Baahubali, Tamil films including O Kadhal Kanmani, Orange Mittai and Radio Petti will also be screened at the Busan International Film Festival.